Fighting fascism with Bionade and almost-Quorn | Guten Morgen Berlin! January 14, 2011 - Guten Morgen Berlin! Imagine this looking even more decrepit and you’re on the money. This blog has grown legs in a way I never expected it would. When I started this little project, I decided to begin with the assumption that no-one would read it except for the occasional leant-on-the-mouse-while-searching-on-Google accident. I wrote every entry for the audience of me, imagining myself as some kind of rogue Charlie Brooker-type character who had the multitudes of urbane and sophisticated readers inside my head nodding with approval, in order to make it seem like less of a waste of human energy. Yet in a dramatic coup I did not see coming, people have been reading it. Mostly friends, of course, and for that I would like to briefly thank you for your very kind support. However, I knew that this project was paying off when it got to the point that people were inviting me to things specifically because they would be perfect blog-fodder; and thus, on a Sunday night, I ended up in Zielona Gora, a political anti-fascist anti-establishment anti-shaving squat in the middle of Friedrichshain. 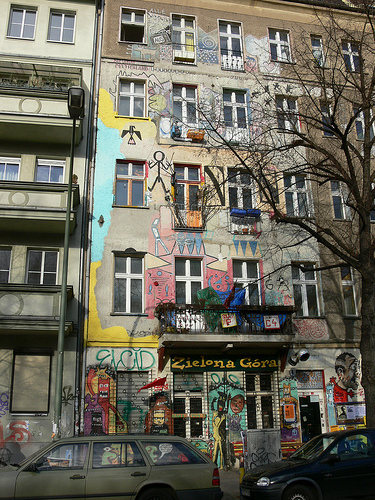 Squats are a bit of a ‘thing’ in Berlin, enjoying a kind of grimy, tofu-fuelled renaissance as the Zeitgeist of wild-haired vintage-loving Berlin hipsters has intersected perfectly with their artsy, angry, bohemian ways of life, like the mythical heavenly alignment of two beardy planets. They are full of art, music, thought and argument, and they open their doors to all of Berlin in exchange for a few euros every now and again to spend on more Che Guevara wall hangings. At Zielona Gora there is a vegan Volksküche (Vokü for short, meaning ‘people’s kitchen’; right on!) every Wednesday and Sunday for any hungry soul to come and chow through an entire trough of surprisingly good faux-mince bolognaise, for example, for just 1 euro 50 a go. Inspired to do something genuinely ‘Berlin’, which in youth terms means ‘gritty’ and ‘like, totally not mainstream, y’know?’, Zielona Gora is a perfect place to spend an evening. One encounters people with remarkably intense stares and astonishingly pungent dogs; the furniture is a fantastic selection of old East-German living room chintz, and every available surface is littered with stickers bearing the kind of political message that can only legally be typed in all capitals, I believe. The cigarette smoke is so thick you feel like you are breathing a warm liquid rather than air, and the man at the bar was so impressed by my Darth Vader sweater that he forgot to give me my change; and being slightly scared of his wild eyes, I chose not to remind him. It was wonderful. Reflecting on it I cannot imagine a more appropriate thing to do on a Sunday night in Berlin, or a more excellent contrast to wading through a gently steaming plate of Sunday roast chicken with veg and gravy while gazing at the quivering jowls of Top Gear’s Jeremy Clarkson on BBC 2. Sadly, though, Zielona Gora has proved to myself and to the world that I am certainly a child of the latter world and not the former. I would love to be edgy and political, but I like tea with milk in it and people who say ‘Good grief’. I would love to feel at one with the people there, but I find their camouflage jackets and occasional lack of teeth unnerving and not particularly a symptom of the kind of political engagement that it seems meant to signify. And, of course, they all know this. They can smell on my breath that I am a lily-livered, pasty-skinned conformist, no matter what pop-culture icon I have emblazoned on my sweater. But, all the more brilliantly, amid the heavy metal music and the smog my awkwardness gradually gave way to feeling comfortable, and from feeling comfortable to feeling overwhelming gratitude that such places exist, where no matter who you are, you can sit with friends and feast and smoke and leer and debate and drink Bionade and do whatever the hell you like – as long as you don’t order a steak and chips.